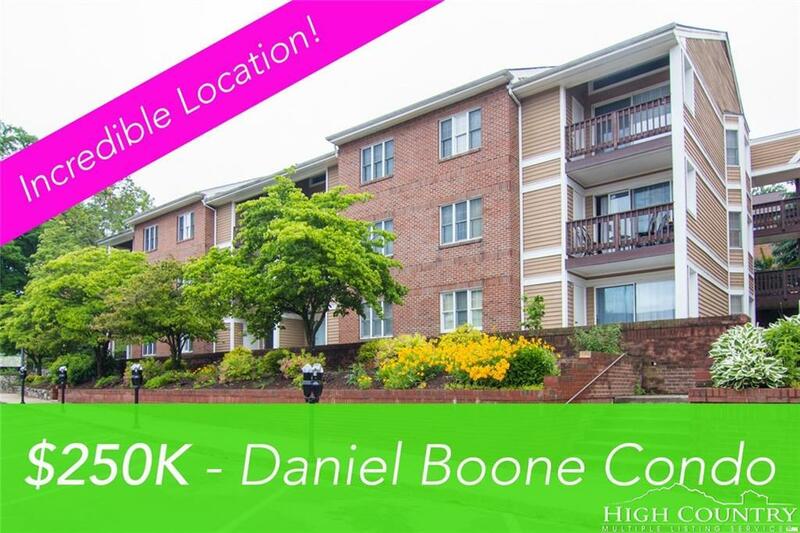 Here's a rare opportunity to own a Daniel Boone condo! Located right off King St in downtown Boone, this condo is walking distance to Appalachian State University, restaurants, shopping, entertainment, etc. You simply can't beat the convenience and location! This 2BR/2BA condo has been completely renovated: Granite countertops with beautiful tile backsplash, stainless appliances, wood floors, updated bathrooms, you'll have to see it to believe it. The living area is an open concept with tons of natural light, built-in shelving and plenty of space for couches and a dining room table. This unit is located right off King St with views of downtown Boone and Appalachian State University. It also has a small covered patio off the living area where you can enjoy basking in the sun while watching people walk on King St. This is the only Daniel Boone condo available and it's sure to go quick in this market! Call today to setup a showing before it's too late!